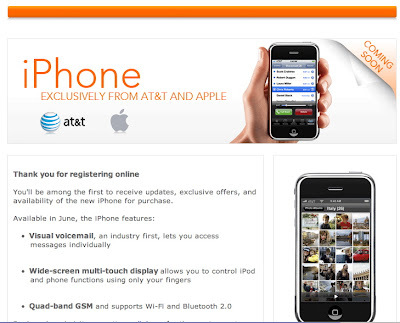 It appears Apple's long-awaited iPhone is on schedule to ship in June, at least according to this email from AT&T (formerly Cingular). And in another rumor, Mobile Magazine reports that in addition to Google Maps, the iPhone may include other Google applications - speculation includes Google News, Google Reader (RSS), mobile Blogger, and Google Calendar. These may not ship with the device, but instead be available via software updates. Neither of these rumors would surprise me. Remember, of late Steve Jobs has taken to under-promising and over-delivering - Intel Macs shipped six months earlier than promised and were faster than promised. Here's a great video (about 10 minutes) from Eric Faden that uses small pieces of Disney films to explain copyright law and fair use. As educators in the new Web 2.0 world, this is one of the biggest challenges we face - understanding these concepts and their implications for what we can and can't do in the classroom and online. Here's a great video created by CommonCraft - a consulting company focused on helping companies and organizations integrate online communities into their businesses. that, in the future, organizations will rely on their community of customers to remain competitive. In just under four minutes, the video provides a simple, easy to understand explanation of RSS - a technology that I and many other have become dependent on to get our news and information. The video also uses a really clever presentation method - yet another alternative to the overused powerpoint slideshow.